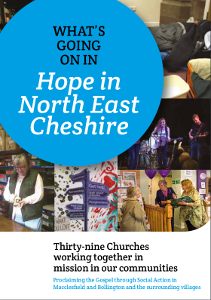 Hope in North East Cheshire (Hope) encourages shared initiatives in mission and service and organises joint gatherings for worship and prayer. 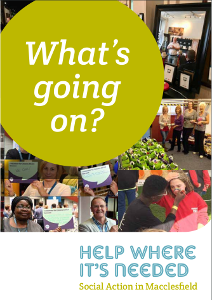 It also responds to requests for information, help and funding, working closely with many voluntary organisations, a number represented here, and the statutory authorities. Incorporating Churches Together in Macclesfield and Bollington, and affiliated to Churches Together in Britain and Ireland, Hope was established in 2009 bringing together some thirty-nine Churches of many denominations in Macclesfield, Bollington and the surrounding villages. The Church Leaders meet regularly for prayer, worship, fellowship and discussion, while small groups of Leaders and lay people plan Hope’s priorities, review progress and relationships, and manage its finances. Hope involves lots of volunteers, many from the local Churches, in a wide range of initiatives which any one Church would find difficult to sustain. It encourages like-minded people to come together to respond to their calling and to share their passions to make things happen for the benefit of the community. Proclaiming the Gospel through Social Action in Macclesfield and Bollington and the surrounding villages.